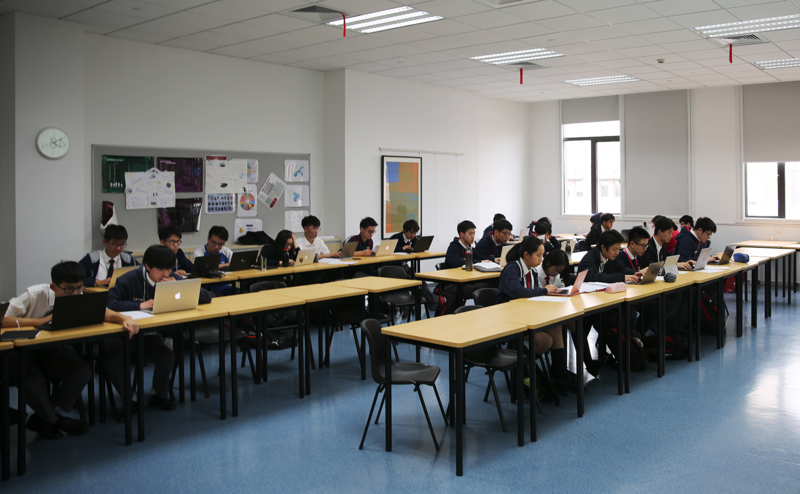 In the penultimate event of the House calendar, Dulwich International High School students gathered to compete in the first-ever House programming competition, battling to prove that they are the best programmers Dulwich has to offer. Each house could enter up to 3 teams of 3 or 4 students, all year groups were invited to attend leading to a strong representation of lower school and upper school students throughout the contest. Riding high on their victory in the House Drama less than 24 hours before Spenser arrived looking to cement their place at the top of the House leader board fielding the maximum 3 teams. Grenville and Raleigh both entered 2 teams whilst Fan entered a single team. On the day of the contest, each team were given 5 never before seen programming challenges to try to complete. These included decrypting secret messages, data recovery and pattern recognition. Students were given only 2 hours to design, build and test their solutions for all 5 challenges. Gaining points for each correct submission in addition to bonus points for program design and efficiency. Speaking about the contest, Mr Rigby commented on how impressed he was that students could quickly understand the requirements of each challenge and immediately start building software to solve the task. Additionally, it was excellent to see how effectively students were able to divide the workload and utilise all members of the team to maximum effect. After the 2 hours had elapsed, each team submitted their group’s solutions to be checked by the Computer Science Department. Team scores were then combined to create a final total for each House. The Spenser teams’ combined score was enough to take 1st place. Raleigh was a close 2nd followed by Fan in 3rd then finally Grenville in 4th. The best performing individual team of the day were a Raleigh side including Tony Z., Karl S. and Tom W. who successfully completed 4 out of 5 challenges. Their stand out performance gained Raleigh some much-needed bonus points. The Computer Science Department would like to thank all students for their involvement and look forward to growing and improving this event for the next academic year!